While half of the professional Motionhouse company toured with BLOCK extensively this summer, therest of the team worked with Kevin Finnan on our brand new show – Torque. The company has become well-known for its large-scale outdoor spectacles, and Torque is the latest in a string of phenomenal shows featuring JCB diggers. 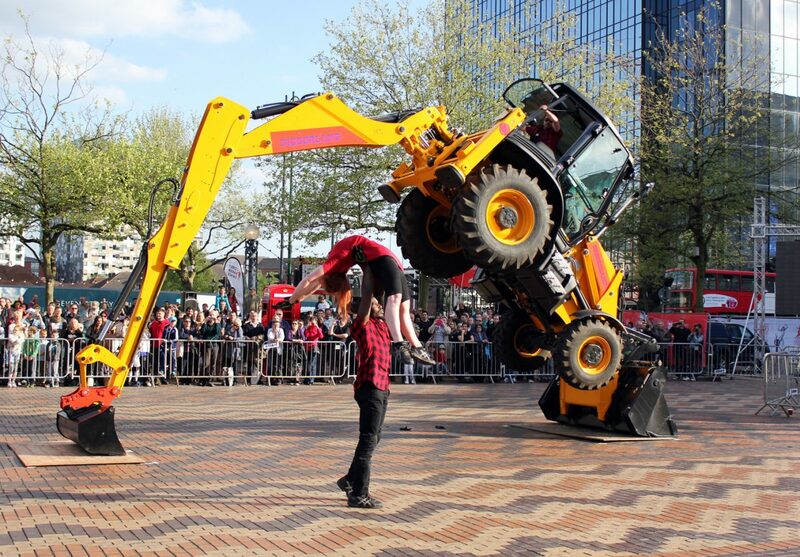 In Torque four Motionhouse dancers work in partnership with two JCBs – and their drivers of course! In 2016 the show was performed as part of International Dance Festival Birmingham’s Live Nights, and at Coventry’s Godiva Festival as part of the 2021 Coventry City of Culture bid launch. 3,950 people came to watch across these two events alone! Motionhouse’s large-scale work continues in 2017 with one of our largest outdoor projects yet! We are delighted to have been commissioned to create a stunning outdoor spectacle animating the harbour in Randers, Denmark, for the Aarhus European Capital of Culture celebrations in September 2017. We can’t wait to share progress from this project with you in the months to come! Click here to watch the Torque trailer!